Crewmembers with a condition that requires medication must bring an appropriate supply of the medicine and be responsible for its safekeeping. It is extremely difficult to obtain certain medicines in the Bahamas and it may be more expensive than you expect! Scout Leaders and Student Trip Leaders must be aware of all medications required by their group, should monitor their use and a back-up supply of any important medication is always advised. Individuals requiring medication should always contact their family physician regarding their suitability for participation in a program of this nature. We reserve the right to make the final decision regarding any individual's participation on medical grounds or otherwise. Any crewmembers with serious allergies that require the use of an Epi-pen must ensure they bring these with them. You should ensure that the Medical Insurance for your crewmembers provides them with all the medical cover you anticipate may be necessary. Maximum age is 60 and maximum weight is 260lbs for all participants. Although the sea state in your sailing area is normally very calm and the likelihood of any crewmember suffering from motion sickness is small, it's inevitable that some will be more susceptible to motion sickness than others. We recommend all Scout, Student and Family crews carry a small supply of Dramamine in the unlikely event that it's required. It's essential that all crewmembers seek the advice of their family physician if they consider taking any motion sickness medication. Families do not have to bring a First Aid kit as each sailboat will have one, however, for Scouts, your B.S.A. Tour Permit requires that each crew bring its own First Aid kit. You bring your First Aid kit to treat minor injuries. Although every sailing vessel in our program has a First Aid kit, your crew leader/crew's trained first-aider must decide whether treatment is necessary and what treatment should be given. All participants should note that if a serious medical issue arises, we'll do our utmost to organize appropriate medical assistance at the earliest possible opportunity, given the limited availability of medical services and the limited extent of medical cover in the islands. All crewmembers must be fit and in good general health and within 12-months prior to taking part in a sailing adventure program, Scouts must ensure their Annual Health & Medical Record is up to date for crewmembers completed and signed by their Physician as well as signed by their Parent or Guardian. Click the Annual Health & Medical Record button to get this form. Any essential updates should be made known to us prior to your arrival. All medical forms will be thoroughly reviewed by us to record individual medical information of concern and you must make sure you provide this information to the Captain of the sailing vessel allocated for your trip. If you don't possess a completed medical form, you will not be allowed to participate in a sailing adventure program until you complete one. You must be aware that we don't employ a physician and completion of an appropriate medical examination in the Bahamas is particularly expensive and difficult to schedule. Please note: For all adults aged 40 years or older, if your family suffers from a history of heart disease or if your weight is close to or in excess of our recommended guidelines, you must consult your family physician to request you undergo a medically supervised stress test. Remember that if the test results are normal, these results do not guarantee safety during your sailing program if you subsequently subject yourself to strenuous exercise. 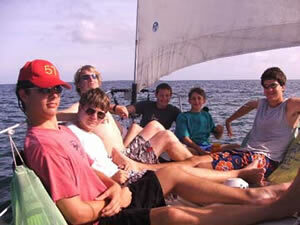 However, if your test results are abnormal, you will be precluded from participation in one of our sailing programs. Diabetes If you suffer from this medical condition you must be able to monitor your blood glucose, be able to adjust insulin doses accordingly and be able to administer a self-injection. We recommend that you, as well as another responsible member of your party, must be able to recognize indications of excessively high blood sugar and to recognize indications of excessively low blood sugar. The diabetic person and at least one other individual in the group must be capable of administering treatment. Anyone suffering from diabetes must consult their family physician, take specialist advice and provide a formal statement confirming that the individual is fit to take part in all the activities involved in the sailing program. Anyone who has previously required hospitalization from diabetes should not take part in this program. Epilepsy or seizure disorder This should not necessarily exclude an individual from participating in our programs although the individual must be able to control the seizure disorder by medications and have achieved a seizure-free period of at least one year prior to taking part in one of our sailing adventure programs. Asthma Unless the condition is severe, asthma does not preclude participation in our sailing programs as long as anyone suffering from this condition has consulted their family physician and ensured that they are in control of the condition. Lung function must be normal with 'only' the use of either pill, liquid or inhaler bronchodilator medication. It's essential that adequate supplies of medication are brought and at least one other crewmember (ideally a Leader) must know how to recognize an asthma attack, how to recognize worsening of an attack, and how to administer the necessary bronchodilator treatment. Individuals who are asthmatic must consult their family physician, take specialist advice and provide a formal statement confirming that the individual is fit to take part in all the activities involved in one of our sailing adventure programs. Psychological and/or Emotional issues These issues should not necessarily preclude an individual from participation. Parents and advisors should be aware that our sailing adventure programs are not set up in such a way to cater for crewmembers with psychological or emotional problems. Parents and/or guardians should be aware that when a participant is subjected to physical and mental challenges, these problems frequently become magnified, not lessened. Any psychological and/or emotional condition must be under control at the time you arrive in the Bahamas and you should not require the services of a mental health practitioner. Crewmembers who require medication must bring an adequate supply. We reserve the right to make the final decision regarding any individual's participation on medical grounds or otherwise.